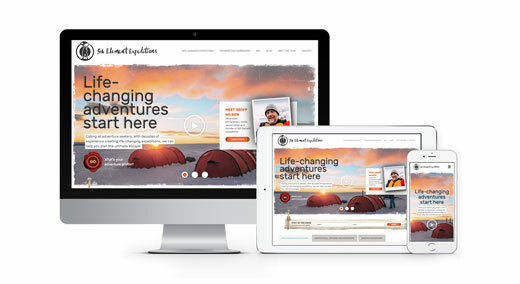 Thinkun recently had the pleasure of designing and developing the website for 5th Element Expeditions, purveyors of expedition travel and high adventure. 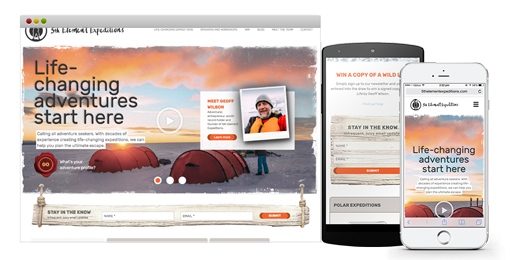 Seeing as 5th Element invites adventurers to test and then push their limits through extreme and survival tourism, it’s appropriate that designing their website likewise provided the opportunity for the Thinkun team to push some of our own limits. Our challenge – to design an interface that would engage clients more at home in the out of doors than sitting in front of their computer – was not so easily overcome. Every aspect of the site required our team to not just think outside of the box, but also to reconceptualise some of the boxes themselves. The primary challenge with the 5th Element site was to create an aesthetic that recreates the natural environment that potential adventurers love to be immersed within. We accomplished this balancing act of natural and digital by seamlessly blending both flat and skeuomorphic design elements. Skeuomorphic design attempts to mimic objects found in the physical world, such as the rope and board design element that catches the user’s eye and invites them to subscribe to the 5th Element newsletter. These elements evoke the feeling of being in nature and are found rarely in modern web design, which has come to be dominated by flat design concepts. You’ve likely witnessed this change yourself if you’re an iOS user, as Apple only recently moved away from skeuomorphic design in their icons (remember the ‘Contacts’ icon that actually resembled a leather-bound address book?) toward a flat and more simplistic design (now your ‘Contacts’ are behind a boring grey silhouette of a face). Responsive design is able to adapt to the many different screen sizes across the hundreds of various mobile devices that your potential clients may be using. The same elements will appear on any version of the site, but the width or height adjusts accordingly across different screen sizes to ensure a smooth user experience. In the case of the 5th Element design, this presented a unique problem. Skeuomorphic elements are notoriously difficult to incorporate into responsive design. 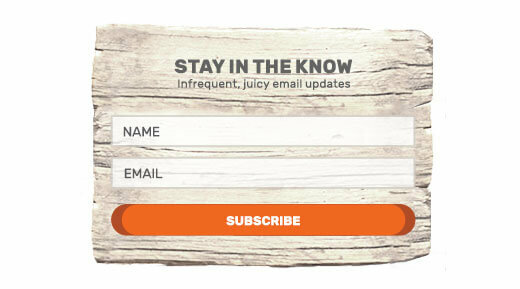 Natural elements – such as the plank of wood behind the ‘Subscribe’ form on the 5th Element website – don’t like to cooperate responsively. Potential 5th Element clients are unlikely to be sitting at a desk and using a desktop or laptop – they are more likely to be on one of the many different mobile devices in use around the world. Responsive design, then, was absolutely critical. Drawing on our many years of experience with responsive design, we were able to create elements that offer a seamless and natural experience on any device. 5th Element site visitors on desktops or phones or tablets will enjoy the same adventure-inspired design and will thereby be engaged on the same level. In September 2015, the balance of Australian tablet usage versus computer usage finally tipped in favour of tablet usage. Using phones for internet browsing, of course, had been prominent for longer still. Two out of every three minutes spent online is spent on a mobile device. People simply aren’t sitting down in front of their computers anymore. Only 11% of adults access internet only via desktop computer, so your website needs to deliver a superior experience on any device the other 89% happen to be using. Of course, physically active clients are even less likely to be parked at a desk, so the implication is even more unavoidable for those business targeted to this market. Who can resist pressing a red button? Beyond reframing traditional design approaches, what makes a project like the 5th Element Expeditions website so fun is incorporating quirky little “easter eggs” like the “press the red button” feature. Nobody can resist pressing a shiny red button and in this case it engages potential clients through the user currently enjoying the experience on offer. When a user presses the red button, they are invited to recommend a 5th Element Expedition to a friend. Referral systems aren’t unique in and of themselves, but the approach to this one is powerful for its mission. 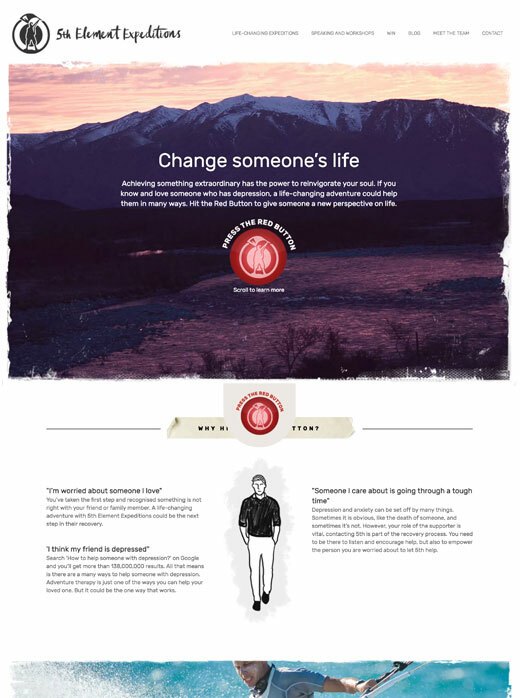 Users who press the red button aren’t encouraged to merely “tell a friend” about 5th Element – rather, they’re prompted to consider if somebody they love is in need of the positive psychological reboot that expedition travel has been shown to provide. Pressing the red button allows large-hearted adventurers to express concern to a loved one without putting anybody on the spot. Naturally, the website we built for 5th Element is so much more powerful than just the user experience delivered by the skeuomorphic design and responsive layout. There are numerous devices at work under the hood of this beauty that make sure 5th Element get the most value out of each visitor. We programmed the 5th Element website with shortcodes that allow the 5th Element team to quickly and easily display products from partner (but external) e-commerce sites. The 5th Element team often have recommendations about equipment and gear that their clients will need for a given expedition. These shortcodes make it painless for them to display these recommendations in a manner that aligns with the carefully considered design of the site. 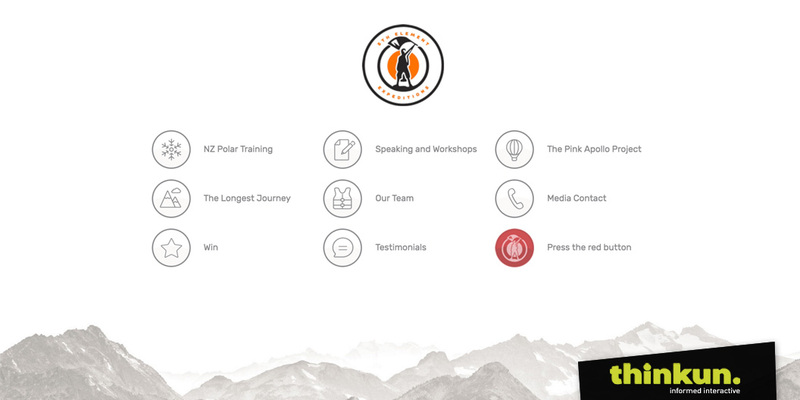 The entire site is peppered with data capture forms that allow the 5th Element team to turn visitors into potential clients and those potential clients into expeditions tourists. The lifetime value of a customer is critical for any experience business and 5th Element is not excepted from this rule. The lead-generation mechanisms installed into their website are the most effective ways for them to tap into this value at the moment when the customer is most engaged. The data captured from these lead generation mechanisms is connected to marketing automation software Infusionsoft. This immediately activates a process that ensures every single lead is followed up and that all potential clients are signed up to the 5th Element email marketing loop. In this way there is no stone left unturned and every potential lead (hot or cold) is followed up along with repeat clients to ensure that 5th Element enjoys the lifetime value of that relationship. Send us a brief message if you need our expertise with a project or would like to know more, and we'll get right back to you. 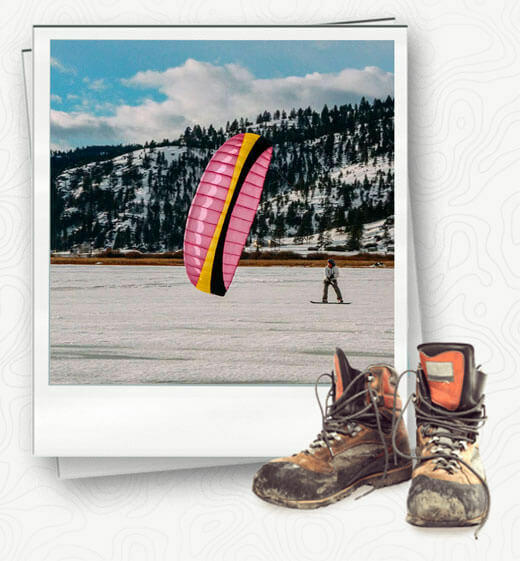 If you are a business that wants to target customers in search of active lifestyles, expedition tourism or high adventure, Thinkun can help you engage potential customers (when they roam back into network range and fire up their devices). 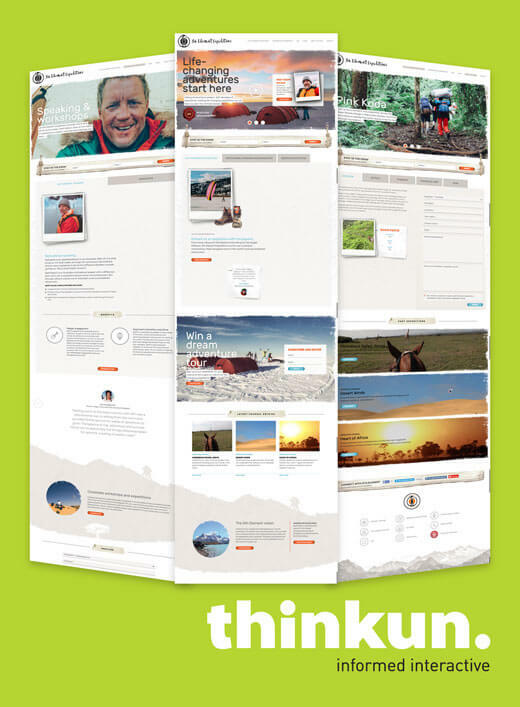 Whether you’re a personal trainer, a bicycle shop operator or an outdoors guide, Thinkun has to power to deliver more than just a website – we can create an interface that is an extension of your very ethos. Your custom Thinkun website will incorporate the design elements that best convey what you and your company are all about, and install them around a user interface that meets your customers where they live. Your web presence will be responsive and dynamic, engaging potential clients in a manner they won’t forget. 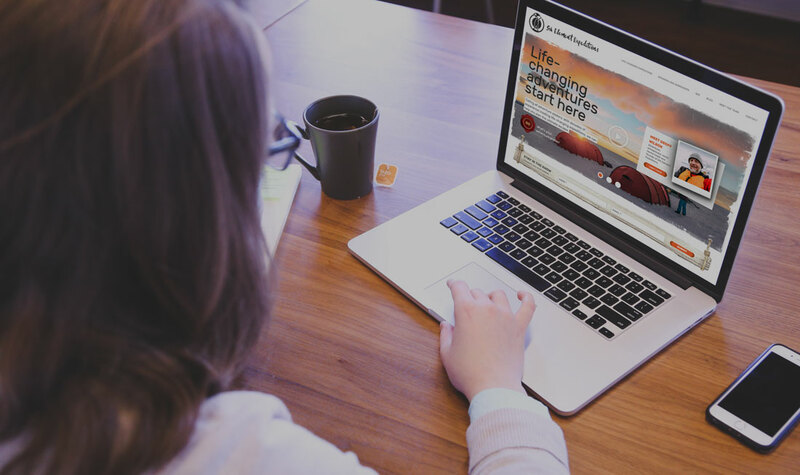 Your value proposition isn’t boring – your website shouldn’t be, either. Your custom Thinkun website will incorporate the design elements that best convey what you and your company are all about, and install them around a user interface that meets your customers where they live. Your web presence will be responsive and dynamic, engaging potential clients in a manner they won't forget. Your value proposition isn't boring - your website shouldn't be, either. Thinkun wins silver in the 2017 W3 Awards!